Despite the announcement made by Indonesia’s President Joko Widolo on 10 May 2015 affirming that the government would no longer impose restrictions on foreign media access to West Papua, the decades-long entry controls for foreign reporters, as well as UN officials and academics remain in force. Consequently, the province of West Papua continues to suffer from isolation, which gives the Indonesian security forces free reign, especially when it comes to restricting the movement of individuals suspected of being “pro-independence” by arbitrarily adding them to a visa blacklist. Indonesian authorities continue to restrict foreign media access to the restive Christian-majority provinces of Papua and West Papua, despite assurances from President Joko Widodo that reporters would have unimpeded access to the region, a rights group says. Phelim Kine, Asia deputy director for Human Rights Watch, said "elements of the Indonesian government" have failed to deliver on Widodo's promise to open Papua to foreign reporters. The New York-based rights group released on Nov. 11 a report interviewing 107 journalists, editors, publishers and representatives of domestic and international nongovernmental organizations. Kine suggested a conspiracy was in place between the Indonesian government and security forces to keep foreign journalists out of resource-rich West Papua, where a low-level insurgency has clashed with military forces for several decades. "There are elements within the Indonesian government and security forces that are intrinsically hostile to the concept of free media access to Papua," he said, adding that a number of senior government and military officials intensely opposed opening the region to foreign media. "This is an ongoing problem. There is no clear process," he added. He said that President Widodo has prioritized development in Papua as a way to provide stability and to appease local citizens' dissatisfaction with the government. Kine said that government officials have acknowledged that open access to information is key to Papua's development. "But what's clear is that they are unwilling or hesitate or suspicious about what opening [the region] to the media might bring in terms of having some influence on the separatist movement in Papua," he said. In addition, Indonesian journalists were "extremely vulnerable to intimidation, harassment and violence" by the government, security forces, and pro-independence groups, he said. 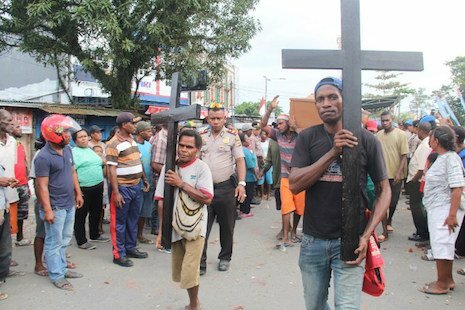 Father Neles Tebay, coordinator of the Papua Peace Network, told ucanews.com that harassment of journalists in Papua is common. "Indeed, Indonesian journalists in Papua — both the Papuans and those coming from other regions — often face cruel treatment if they write something that annoys the government," he said. Still, the people in Papua have other avenues to distribute information with or without the help of a foreign media presence in the region, he said. "In terms of the distribution of information, the presence of foreign journalists in Papua doesn't have real influences. Whatever happens in Papua, they can be distributed through social media. So there's nothing that can be hidden in Papua. The Internet is already here. It can't be blocked," he said. Andreas Harsono, an Indonesian researcher for Human Rights Watch, said foreign journalists are routinely hassled when applying for visas. A British journalist applied five months ago for access to the region and still hasn't heard back from Indonesian authorities, he said. Harsono called on Widodo to formally lift restrictions on foreign media access to Papua and direct all government and security officials to immediately comply with the order. Click here to read the Human Rights Watch’s report ‘Something to Hide? Indonesia’s Restrictions on Media Freedom and Rights Monitoring in Papua’ published on 10 November 2015.